While museum educators (myself included) spend a lot of time thinking about the types of questions we ask to visitors and students, I’m not sure we spend enough time considering how to motivate visitors to ask their own questions? We know that getting visitors to ask questions can be an extremely important way to tap into their sense of “wonder” and curiosity, both key elements of a meaningful museum learning experience. So how do we get visitors to ask more questions? How do we get visitors to ask more questions? One technique that many educators use (including those at the Getty) is simply modeling the type of curiosity and open discovery that we want in our visitors. Choose an object early in a tour, and demonstrate some of the types of questions we might pose — information-based questions, museum-related questions, personal questions, and questions that allow us to use our imagination. The idea here is that visitors will feel more comfortable if you, as an educator, have opened the door to these types of questions. Being transparent about your motives here can be helpful, so that visitors or students know that you expect them to ask similar questions as the group moves to new objects. Creating a comfortable and inquiring environment for visitors is key to getting them to ask questions that matter to them. Elliott Kai-Kee mentioned this during their NAEA session. After introducing an object on a gallery talk or tour, he simply states: “I’d like to start with a question you might have for this object.” Of course, wait time is crucial here … remember to allow for silence if needed, and those first visitor questions will eventually spring up. This strategy truly uses visitor questions to drive the learning experience, and gallery teacher & visitors become fellow inquirers. Object selection can play an important role, too, as there are definitely some artworks that will likely spark more immediate questions in visitors. For example, in my own experiences, a large enigmatic painting by German artist Max Beckmann might draw out more immediate questions and curiosities than a Worcester porcelain coffee cup. Sometimes, it can be quite productive (especially for school groups) to allow time for students or visitors to brainstorm a list of questions they might have about an artwork. This can be as simple as each person writing down as many questions as they can about an object. An educator can take this further by inviting participants to pair up, review each others’ questions, and select one or two to share with the larger group. By doing this, you can quickly generate a large number of questions driven by students’ or visitors’ interests — a great place to begin a conversation about an object. 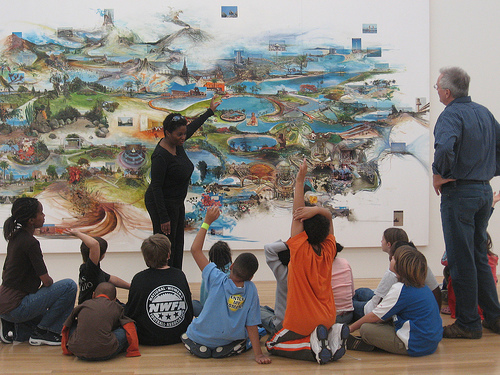 One very effective “thinking routine” developed through Harvard’s Project Zero and the Artful Thinking project is called “Creative Questions.” This routine provides students with a series of question stems, and encourages them to be creative and come up with a list of several questions about an artwork — using the suggested stems only if they need help brainstorming different types of questions. While I tend to avoid using worksheets in the galleries, I often use this with students — and it can generate some interesting and fun questions (I especially like questions that come from the stem “How would it be different if…”). As with many thinking routines from Project Zero, this strategy can expand and deepen students’ thinking in relation to a work of art and encourage their curiosity. What are some other ways that you have been able to motivate visitors and students to ask questions? 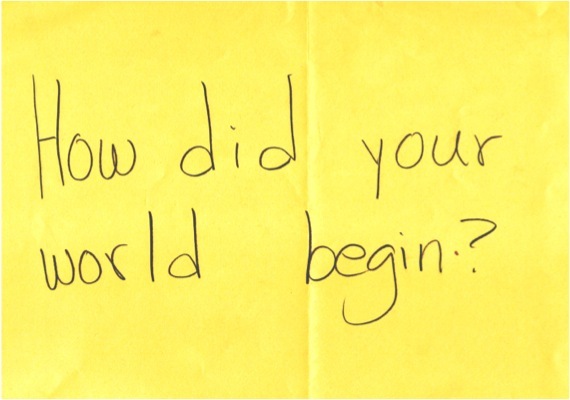 How do we continue to create these learning experiences driven by visitor questions? Mike, thanks for posting this! I missed the beginning of the session, so I am thankful for your recap. Lots of great gallery teaching ideas here. Also, a lot of this reminds me of another program/session I saw at NAEA: the National Gallery DC’s family program Artful Conversations (http://www.nga.gov/programs/family/#artfulconversations) that is based on Artful Thinking from Project Zero. It’s very structured, but definitely promotes questioning, and I love that they adapted it for a family audience for adults with their children. No problem, Chelsea. The session got me thinking a lot about how we can motivate visitor questions, and then also what that process might teach us about our own practice as educators (it sounded like that was a big outcome for the Getty educators — would you agree?). This does have strong connections with the NGA family program, and I think that might come from the Project Zero thinking strategies at the core of what they are doing. One of the core things that visitors/families are asked in these experiences (if I remember correctly) is “what do you wonder?” This open-ended question comes right from teaching strategies like Project Zero’s Artful Thinking as well as adaptations that other museums have created. I hope one day that I have the opportunity to bring my family to one of those Artful Conversations at the National Gallery!